gorilla) at the Grant Museum. 1) In 1929, a joint expedition was led to Africa by Columbia University and the American Museum. Back in ‘the day’, conservation was much less of a buzz word and ‘endangered species’ was less of an everyday phrase amongst scientists. 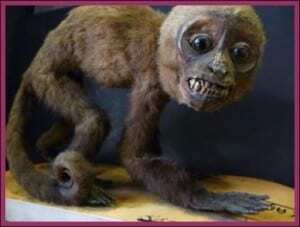 Subsequently, many explorers are well known to have gone about shooting things and collecting specimens to take back to their home countries to show off to their peers. 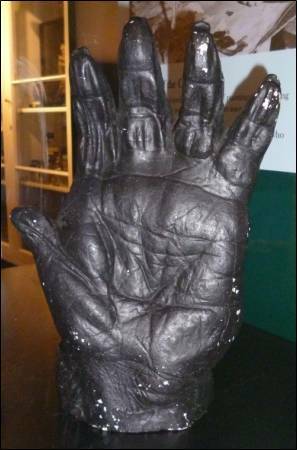 The reason I love this specimen is because it is reported to be a cast taken of the left hand of a wild male Western gorilla. The cynical amongst us could argue of course that this fragment of information does not exclude the possibility that the gorilla was not left alive and free post-plaster-of-paris to go about its business, but neither does it imply this was not the case. I choose to be optimistic. 2) Given that humans and gorillas share between 95 and 99% of their DNA (depending on what you count), it is no wonder that a gorilla’s hand is so humanoid. With hairy backs and hairless palms, very little other than the sheer size of a gorillas hand separates theirs from ours. Used for climbing trees (subspecies-dependent), grooming, eating, and tool grasping, our hand uses are not so different either. The only real and somewhat major difference being of course that, except in rare cases, humans do not use their hands for locomotion. Gorillas are famed for their knuckle walking, something that hasn’t yet caught on amongst vertical-orientation-challenged acrobats. 3) There are two species of gorilla, split into four subspecies. This hand cast is of one of the two western gorilla subspecies which both conveniently and no so coincidentally inhabit areas in the west of Africa. 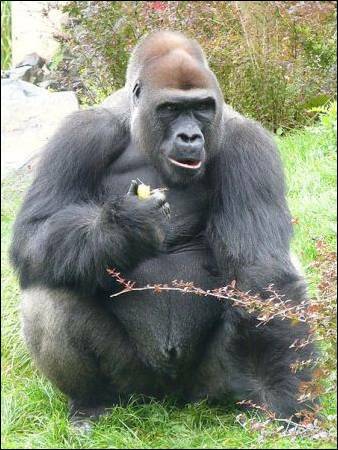 The eastern gorilla subspecies lives in the north. Not really. For those of you who are skim-reading, eastern gorillas live in east Africa. Although it is not known which subspecies of western gorilla this cast was taken from, the odds are it was a lowland gorilla as the other western subspecies, called the Cross River gorilla, was likely to have been rare during these times and was even declared extinct in the 1960s, due to human warfare, just 30 years after the expedition. Thankfully, in the 1980s a few isolated populations were rediscovered but scientists estimate that only around 300 individuals exist in the present day. Bad times. Western lowland gorilla. Image by Pudelek. 4) Western gorillas have less dense hair than the mountain (eastern) gorillas, made famous by Dian Fossey, as they do not live in such cold temperatures, but they share the characteristic broad chest, thick neck and strong hands and feet. Slightly smaller than mountain gorillas, which are the largest living primate in the world ‘fyi’, western gorillas are able to climb trees even as adults. Mountain gorillas have to kick that habit as teenagers when they bulk out and put on weight. Western gorillas are brownish in colour, and many have a red or auburn crop of hair on the top of their head like a red cherry atop a gorgeous cake. Awww. 5) Western gorillas were once of less concern than other subspecies to conservationists due to their large natural range which was thought would create a natural barrier against serious consequences of human intervention. But of course mankind inevitably found a way to mess it all up and they logged so much of western Africa that now the western gorillas long-term future has been thrown into question. To make matters worse, the ebola virus has spread through wild western gorilla populations, and, unlike their eastern cousins, western gorillas are hunted for bushmeat. Still, as dismal as all that may seem, ‘endangered’ is a much better prognosis than the ‘extinct’ conclusion declared in the 1960s right? It’s good to end on a high point methinks. Fantastic blog as always – keep them coming!